Shipping and packing fine art is our specialty. Moreover, while Fine Art Shippers is largely known for shipping paintings, sculptures, and other art pieces, we are also experts in shipping a whole range of other valuable and delicate items. This includes everything from antique furniture to exclusive interior design pieces. For example, Fine Art Shippers is proficient in shipping and packing fine rugs and carpeting of any size and thickness. As a result, we work with many reputable stores and dealers specializing in selling rugs and carpets. Besides, we can recommend our clients some of the best destinations in the United States to buy truly exceptional items, and Oscar Isberian Rugs is definitely one of them. 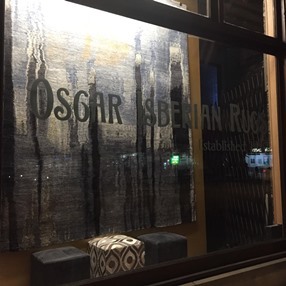 Established by Oscar Isberian and his brother Megerditch in 1920, Oscar Isberian Rugs has long been a must-visit destination for fine rugs and carpeting of the highest quality. For today, this premier rug retailer has locations in Chicago, Evanston, and Highland Park, Illinois, all operated by the third generation of brothers, who successfully runs the family business. You can find there everything from oriental and artisan rugs from India, Pakistan, and Nepal to contemporary carpets with a unique design. Truly amazing! Shipping and packing rugs like that is a great pleasure for Fine Art Shippers, and we would be happy to deliver any of them to your home! Just give us a call, and we will ensure that your new exclusive rug arrives at the destination in its perfect condition and on time!